Looking for a luxury home, apartment, townhouse or condo with spectacular views of the New York City Skyline? Perhaps you are searching for your dream house in Northern New Jersey with easy access to Manhattan. You’ve come to the right place! On The Waterfront is headed up by RealtyLine Sales Associate Joyce Dubin. 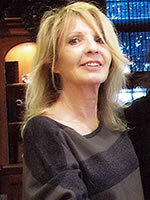 Joyce is committed to providing outstanding service and value to buyers and sellers. Joyce is as serious about her profession as she will be in helping you to attain your real estate goals. Whether you’re interested in buying or leasing an apartment or townhouse along the Hudson River or anywhere in the Northern NJ area, Joyce will be relentless in her commitment to providing you with supreme service, as she works diligently on your behalf. Whatever your real estate ambitions are, optimize your experience by putting Joyce on your side. She will turn your real estate dreams into REALTY! Joyce will take the time to listen to your needs and dreams. She will work tirelessly to facilitate your goals without compromise and is committed to treating every client as if they are her #1 priority. Proudly serving Northern NJ for nearly twenty years! Contact Joyce Dubin for Your Luxurious Northern NJ Home Today.